Delicously gooey and indulgent, these Cadbury Creme egg brownies are the ultimate Easter sweet treat! If you’re a fan of creme eggs, then you absolutely MUST try these brownies. Seriously, stop what you’re doing IMMEDIATELY, go into the kitchen and make them. You won’t regret it. Not a fan of creme eggs? Try my Cadbury caramel egg brownies instead! These brownies first caught my eye when a friend of mine posted the picture on my Facebook wall..and after that different versions of this Easter themed treat kept appearing on my news feed almost every day. I felt it was a sure sign that the universe was telling me I needed to make Creme egg brownies. 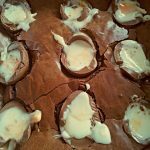 I tried Cadbury creme egg cupcakes last Easter and they went down a storm with my lot, so I couldn’t resist giving these brownies a try. Can I freeze these creme egg brownies? Yes you can. When the brownies have completely cooled, place them in an air tight container and freeze for up to 2 months. how long will these creme egg brownies last? The brownies will keep well for up to 5 days, although as all brownies do, they will get a little drier after a few days of storing. But I honestly wouldn’t worry about it – they never last longer than 2 days in my house and I suspect you will be the same! If you want to cut these brownies into neat squares then I would recommend refrigerating them overnight before slicing. But if you just don’t want to wait (and I wouldn’t blame you!) then just grab a spoon and dig in! Vanilla ice cream is a delicious accompaniment. All that’s left for me to say is just make them – your family and friends will love you! Originally published 27th March, 2013. Republished with new photographs and updated text 21st March 2019. Pin these creme egg brownies for later…. Deliciously gooey and indulgent, these Cadbury Creme egg brownies have got to be the ultimate Easter sweet treat! Grease and line a 22cm tin with baking parchment. Preheat the oven to 180C/160 fan/350F. Slowly melt the butter and chocolate together in a small saucepan. In a large bowl, whisk together the eggs, sugar and vanilla extract. Whisk in the slightly cooled but still warm melted butter & chocolate mixture. Stir in the cocoa powder, flour and salt, mixing well until you have a smooth, shiny batter. Pour the chocolate batter into the baking tin and place the halved creme eggs on top, spacing them out evenly. Bake for 30-35 minutes, or until the brownie is set around the edges and the top is crispy. Leave to cool completely before turning out and cutting them into bars. If you aren't a fan of creme eggs you can substitute them with Cadbury mini eggs..or Cadbury caramel eggs...or Reeces peanut butter eggs! I made these at the weekend too, yours look great! Reblogged this on Something Sweet Something Savoury. Thanks so much Hannah – I feel the same way! Creme eggs remind me of my childhood so I’ll always have a soft spot for them!